A young orphan is sent to the village of Moonfleet, in Dorset, England to stay with his mother's former lover, who has the facade of a gentleman but is a leader of a gang of swashbuckling bootleggers. The duo went on a treasure hunt. 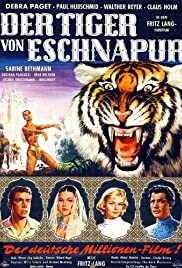 "Journey to the Lost City" is not a specific film by Fritz Lang but the combination of Tiger of Bengal (1959) with its sequel The Indian Tomb (1959), done in 1960 by American International Pictures. I was wary of purchasing Fantoma's 2-Disc Set of "Fritz Lang's Indian Epic" after being somewhat let down by the 1921 Silent original (co-scripted by Lang himself) and also its less-than-stellar reputation. For this reason, when the second part of the saga turned up on Italian TV a couple of years ago, I decided to check it out just the same so as to get an inkling of what to expect! I recall thinking it pretty kitschy and unworthy of Lang's enormous talent, but Fantoma's sale (through their website) of their entire DVD catalog a few months back made it an irresistible acquisition! Well, having now watched the entire saga (with dialogue and in color, as opposed to the rather static Silent version directed by Joe May - although hearing the Indian-garbed characters talking in German took some getting used to), I was pleasantly surprised by how genuinely engaging and sheerly enjoyable it all was! Though it was sold as an epic production (to the point of concluding ESCHNAPUR with the promise that Part II would feature greater thrills and even more spectacle) at a time when such films were all the rage, the saga was actually a pretty modest undertaking by eclectic (and prolific) German producer Artur Brauner. Despite the two films' exotic, handsome look (not least in the provocative dances of Debra Paget), the budgetary constraints were painfully obvious in the special effects department, especially the hilarious appearance of a 'ropey' cobra which is intended to 'test' (the scantily-clad) Miss Paget's faithfulness to the Maharajah!! All in all, even if these films hardly constitute Lang's greatest work (though he harbored an evident affection throughout his life for this particular tale, which was originally conceived by his former wife Thea von Harbou), they have great - and enduring - appeal for aficionados of old-fashioned, serial-like adventure stories tinged with romance and mysticism. Even so, while I don't subscribe to that school of thought myself, there are some film critics (Tom Gunning, Jean Douchet and Pierre Rissient among them) who think very highly of Lang's Indian diptych - the first considering it one of Lang's towering achievements and the last two numbering it among the ten greatest films of all time! !